No. Bank Me for short. See below for details and transaction history. 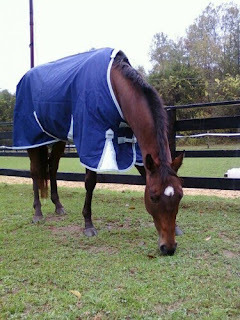 Bank Me is a cute little Thoroughbred at Akindale. He is a project for me, at least for this week. Erin and I are embarking on a hunter pace next weekend off Akindale/ local land, the Woodbury FFA Hunter Pace. I went to Nonnewaug High School, home of the Woodbury FFA and the Agri-Science program I went there for, majoring in Veterinary Science. It was an incredible four years for me, full of friendships, incredible teachers, and where else could I bring my horse to school to use as an English demonstration? Today was my first time hanging out with and riding Bank Me. Shall I call him Banky for short? Binky? Blinky? Banky Buns? He was one of about 20 horses that made the massive trip from a slaughterhouse to Akindale's fields a few years ago, and it wasn't until this year that he developed a relationship and bonded with Erin, and she decided to see what he was made of. He's made out of holy cuteness, that's what! Seriously, while a bit nervous under saddle, he moves more like a Quarter Horse than a Thoroughbred - he's a stocky 15.1 hands, with a trot that floats along in short little steps, arching his neck and asking for more communication with you via the bit and reins. He's not terribly confident in himself but he is very eager to please, throwing in a few joyful leaps and snorts at leaves whooshing by in the gusty afternoon. I'm looking forward to seeing what next week brings with his rides, and a "dress rehearsal" Erin and I are planning for our pace competitors - we'll load them up into the trailer, take them somewhere else on Akindale property, and ride a "practice pace." That way, they get to see unfamiliar terrain, ride in the trailer, and then come back to their own barn. Also, we'll know what we're dealing with in terms of the mentalities of the horses based on this practice run. Once we were done with our "getting to know you" ride, he discovered that I have carrots. Lots of 'em. And he was going to make cute faces in order to get them. I suppose he's the International Bank of Carrots now...! 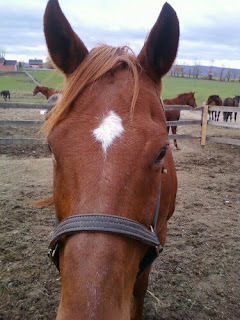 Remember a few weeks ago, when I mentioned a third horse I was working with at Akindale? I finally got a few good photos of her to share with you! Pictured below is Friend's Case, also known as Casey. We find it slightly hilarious that we share the same name. How cute is this girl? Casey is about 8 years old, and she ran in 29 races in her youth. Although I find it shocking that she ran anywhere other than to the salad bar....she is certainly what I would call plump! That photo above makes it look like she heard me call her plump. As if to say, "Plump? Who are you callin' plump?" Alas, Casey looks like that a lot. She has what we call a "foal eye," meaning you can frequently see the whites of her eyes, which is usually a sign of stress or panic in a horse. Many foals show their whites as they're taking in new surroundings and exploring their world. Casey is the same. She's not panicked, but she's very aware of what's around her. It's actually a very cute and endearing trait. The reason I'm working with Casey is because she's what I would call a nervous Nellie. She is a doll and has come so far in just a few weeks. Before I started working with her, people couldn't brush her. She wouldn't stand still, she'd constantly move and basically work herself into a state. Now, I can groom and tack her up while she's crosstied. She still gets a little anxious, so I just stop what I'm doing, take a few deep breaths (which she reciprocates), and I wait for her to calm to continue my work. Oddly enough, she adores having her mane and forelock brushed - like she knows it's an important part of any girl's beauty regime! This was just before I hopped on her. She didn't like to stand at the mounting block when other people got on her, but I spent a session with her just working on mounting, and letting her realize it wasn't a big deal and taking my sweet time with her. It's paid off. She stands completely still until I'm settled in the saddle. She also has a trot that would melt your heart...many times, a trot is bouncy and a bumpy ride unless you're posting (rising and sitting with the rhythm of the trot). I could sit to Casey's trot all day long. Tomorrow, Erin and I are taking Casey out on her first trail ride - Erin will ride a calmer, more solid horse, and I'll be on Casey. We're curious to see how she does. My prediction? 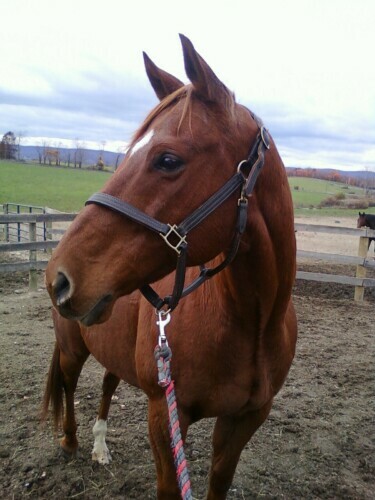 Once we get away from the barn, she'll relax and perhaps even enjoy herself and get caught up in the fun of the ride. Baby steps. She's a good girl, and hopefully up for adoption soon. She deserves someone who loves her like none other. Saturday was a gorgeous, idyllic fall day. It was also a day full of nerves, excitement, and determination. It was the day of the Annual Hettinger Challenge Hunter Pace, held on and around the grounds of Akindale. What the heck is a Hunter Pace, you ask? 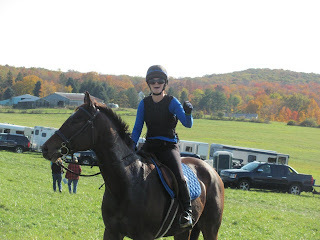 A Hunter Pace is a timed trail ride with optional jumps, where teams of 2 or 3 compete together. However, the catch is that the competitors have no idea what the optimum time is, so it's a guessing game and therefore, half the fun. In my opinion, it's a competition without the stress of competition - and like a marathon for runners, it's a victory just to complete it. Most paces are 6 or 7 miles, and this pace was nearly 10, requiring riders and horses to be very fit! We were very excited before the start, but Zeus still managed to take some moments and get his head in order and his game face on. Here we are, before heading to the start box. Another fun part of pacing is the friends you see and wishing everyone luck and cheering on the other riders. Pictured with us below is a woman I look up to, Ann Leary (second from left), and her riding partner Jen, a veterinarian and avid horsewoman based out of Washington, CT. Ann and Jen ended up placing 4th in the Hunt Division! Here's team TMF! Arliss and Siggy looked fantastic in TMF's royal blue and black colors, and handled the busy, frenetic trailer field with ease. The terrain was challenging during the ride - lots of hills, tricky footing and winding trails that made you pay attention to stay on course. Zeus led his big brother the entire way, with nary a glance at things he'd never seen before - geese, cows, overzealous stallions, scary decorations...I could go on and on. Both Zeus and Siggy really rose to the occasion and gave us their hearts and their trust to navigate the trail, and not steer them wrong or take them somewhere unsafe. That's a big moment for a horse and rider - when the horse trusts you enough to let you pilot them around unfamiliar territory - 10 miles of it, no less! This photo was taken by Ann Leary, just as Zeus and I crossed the finish line, with Siggy not far behind us. I think that's a mix of elation and disbelief on my face, and as you can see, Zeus is a little warm but still alert and I think, enjoying himself! Sunday was a day of rest for all. However, Zeus kept coming up to me when I was at the barn, noodling at me as if to say, "Are we going on another adventure today?" He is constantly surprising me when it counts. At 5 years old, he handled an unknown competition with ease. Now, we wind down for the winter. No major competitions coming up until the Spring, so everyone gets to take a breather through the holidays. Although we've only done two events this year, Zeus and Siggy have shown incredible heart, and gave us everything we asked for. 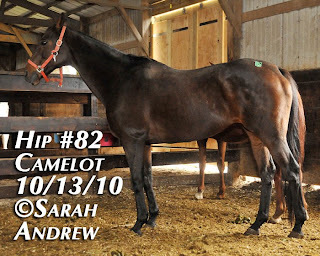 Remember #82 from the Camelot auction this past Saturday? She came home to Akindale this evening. I had a lesson to teach but came over as soon as I could, with Matt in tow, to meet this new little wonder. The moment I walked into the field, she marched across it and right up to me to say hello. Karen, another Akindale colleague, was there and said, "She knows who saved her." She looked me straight in the eye and gave me a warm hello. I can honestly tell you, it was such a cool moment. Then came the ceremonial removal of the Kill Pen tag on her rump. Taking off that number was like taking off years of possible mistreatment, confusion, and whatever else she endured...and a venture into a new, loving life. Once that was done, I did a quick check all over to make sure she didn't have any major injuries, and as I thought from the photos taken at Camelot, her legs are very clean and in great shape. She took in her surroundings quietly and with grace - and when she did move to check out another spot in her field, her movements were fluid and easy, even after a few hard days at the auction house and a long trip in a trailer. Once I really got a good look at her up close and was able to watch her move...one name in particular struck me. Flurry. She has a smattering of white fur on her face, forming a very faint star - almost like a flurry of snow. She's dainty but has conviction in her movements. Flurry seemed like such a perfect name for her! I felt like it was Christmas morning....can you tell? Seeing her in person, knowing my gut instinct was right and paid off....awesome. Happiness is. Happiness is Flurry. Today was a first for me. I rescued my first horse from the Kill Pen. We don't know much about her yet....except that she is a 12 year old Thoroughbred, about 15.3 hands. She rode through the auction like a star, but no one bought her, so she ended up in the Kill Pen with a deadline of noon on Saturday to save her....or else she would be shipped to slaughter in Mexico or Canada. She was at an auction called Camelot in NJ, and through the modern day miracle of Facebook, an organization formed called Camelot Horse Weekly. These volunteers go to the auction, photograph the horses, and then campaign them to be homed before their noon Saturday deadline. 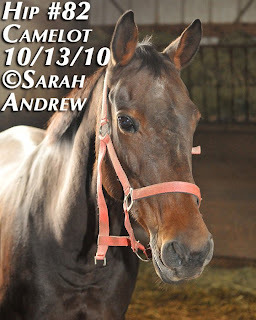 As of November 2010, it will be the one year anniversary of NO horses being shipped to slaughter from Camelot. With an auction house that gets approximately 40-60 horses per week through their doors, this is no small feat. 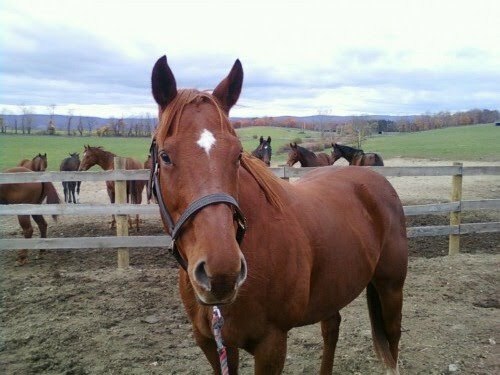 I am a member of this group, and saw this mare when the list and photos were posted Thursday. I kept an eye on her, and was shocked when no one nabbed her - she has great conformation, good bone structure, and clean legs - all great traits for a horse who was once a racehorse. The 11th hour came, and I had to do something - so I contacted my boss at Akindale Thoroughbred Rescue and asked what we could do. She said we can ship the horse and she'll have a home at ATBR, but someone would have to raise funds in order to save her - a total of about $480. Ooooook. Did I mention it was 11:45 AM when I talked to her? So the campaign began. Strangers, other people on the CHR page, offered up their hearts and wallets to save this girl. I called with my own credit card, and bailed her out. She will be coming home to Akindale on Wednesday. I cannot wait to meet her. 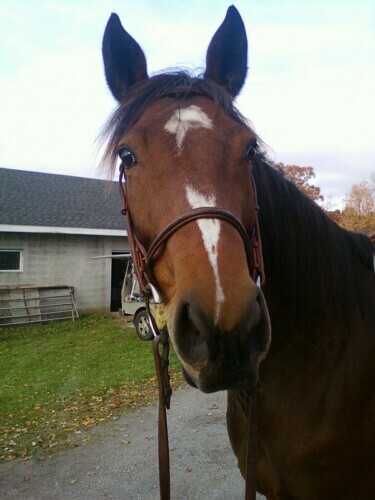 Look at that face....the broken halter, with those kind, doe-like eyes. I think she's pretty special. I am going to personally take her onto my roster of horses to work with, as I feel a direct connection with her, having been the one to make the final move to bring her home. Hopefully, we'll find out more about her when she arrives - some horses come from the Kill Pen with their papers, or at least their Jockey Club (racing) name....and from there, we can see her racing history and pedigree. Stay tuned to find out updates about our newest little girl! With lots of photos of course. You are also very welcome to make a donation on her behalf to Akindale. Just go to the link above and head to the Donations page. 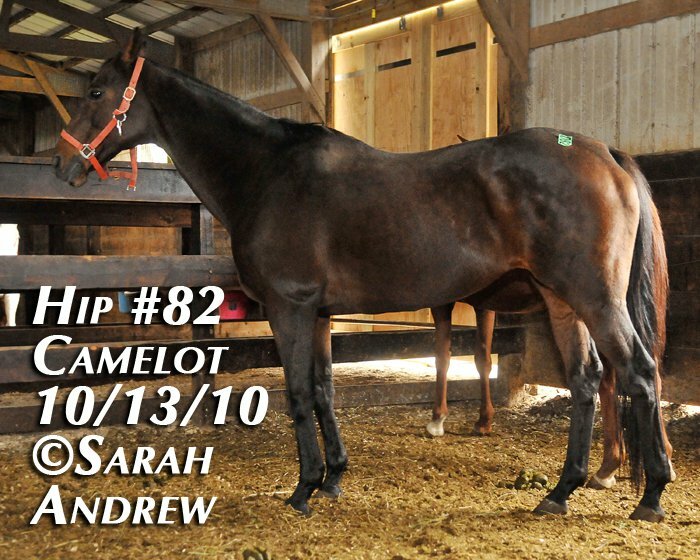 Mention horse #82 from Camelot, and it will be allocated to her. Busy day tomorrow....it's Akindale's Family Fun Day! Sometimes I can't help but blog about food, because I seem to be surrounded by calories. Like cheese, wine, cakes, and pies. Last Thursday evening, we had Matt's parents in residence, and we invited our neighbors, Peg and Paul over for a small dinner party. When Peg and Paul arrived, they brought a lovely bottle of wine with them, and a white bakery box. 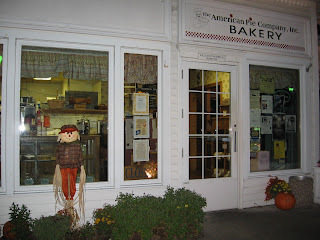 As a welcome to the neighborhood, they decided they had to introduce us to the nearby American Pie Company, located in Sherman CT. They brought a raspberry peach pie, freshly baked and just waiting to be enjoyed. I can easily say that this was, hands down, the best pie I'd ever had in my life. Where do I start? The crust! It was light, flaky, and dusted with some sugar. The fruit was as fresh and plump as if it were just harvested that day. Even Matt, who says he's not a "pie guy" absolutely inhaled his slice of pie and unbeknownst to me, has been pilfering the leftover pie slowly but surely. Peg and Paul - they're good people. They are good pie people. If you're local, go to this lovely little bakery, just 10 minutes from TMF. If you're not local but you come to our area, go to this lovely little bakery. You won't be sorry. Well, I'm sorry. I'm sorry there's no pie left at our house. We had a dinner party this evening. Not just any dinner party, but one full of blessings, good tidings, and some hilarity that ensued, as only it can do here at TMF. Father Bob, the wonderful priest who married Matt and I, came with my parents to bless the house, barn and animals. After he was done "working," I'd planned a nice dinner to thank him - a dinner that was a long time coming, since we discussed the menu at my brother Jay's rehearsal dinner back in July! We began the blessing in the house after initial greetings and before the wine was unleashed. When I'm really trying to focus on words, I'll close my eyes and bow my head. I did just that as Father Bob (or FB as we call him sometimes) began the blessing. About 10 seconds after he started, there was a "ZOOM!" across my shoes. Knowing full well it was a cat, I tried to ignore it and let a smirk slide across my face. Ten seconds after that....another, "ZOOM" followed by a "Wham, POW!" Monster decided a mere drive-by wasn't enough the first time, so he decided to bash himself into my legs the second time to make sure I knew he was there. I couldn't help it. A giggle snuck out. Followed by a snort and then an outright guffaw, as everyone looked up at me, bewildered. "I'm so sorry!" I said. I tried to explain Monster's cameo appearance, followed by his kamikaze crash into my shins. So much for being reverent. After that, Monster wisely hopped up on a nearby chair where I had to pet him for the remainder of the blessing, lest he decide he was being left out of the ceremony. FB had the best remedy for silly cats who interrupt him....he made sure to douse Monster in some extra holy water! He made himself scarce after that, but he is quite a blessed kitty now. The horses took the blessing with their usual ease, Zeus nodding his head as if he agreed with everything FB was saying. We had prepared a little thank you for FB, and Zeus "counted his blessings" by pawing the ground on command. Then he attempted to eat the bottle the holy water was in. A dinner of balsamic poached chicken with roasted red potatoes and garlic infused green beans followed, capped off with the one and only Death by Chocolate cake. Once our guests had departed, Matt and I got to work on dishwashing, belting out duets. I think our best was "Time of My Life" from Dirty Dancing. Complete with shimmying at the sink. Because really, what other way is there to do dishes? I haven't done an Akindale update in awhile, so here we are! I am working with three horses now - Paris and Chief, who you've met, but you haven't met Casey yet. (Ironic that we share the same name, eh?) Friend's Case is a new horse I'm working with, and I'll do a profile on her soon. But let's do a little chat about Chief. Who is one of the funniest horses I've ever met. Now, if you'll remember, Chief is only 3, and he's never been ridden before. Having someone on his back is a completely foreign concept. Some horses absolutely freak out, bucking, bolting, and carrying on. What did Chief do? He posed for the camera, that's what. In all seriousness, Chief was thoroughly amused that the lady who feeds him umpteen carrots and sings, "Heeeeere, Chiefy-chooooo!" in the field to him was sitting on his back. He was fascinated with the fact that my boots were in snuffling and nibbling distance. He would bend his head and grab the reins like a puppy grabs his own leash, loving this new game. But he wouldn't go. When you ask a horse to move forward, you squeeze with your legs. Most horses being ridden for the first time will feel that sensation and shoot forward, almost as if you have an open tube of toothpaste between your knees and you squeeze it. When I would squeeze Chief and say, "Walk," Chief would crane his head around and either give me a quizzical look, or snuffle my boot as if to say, "Why are you doing that?" I soon learned I could do a salsa on his back, and he wouldn't care. To be honest, these photos were taken yesterday, and it was my third ride on Chief. I was delighted that after some coaxing, we were off! Chief made faces the whole time, the little comedian that he is. But you can see the grin on my face, as he finally had his "aha!" moment and he moved forward on his own. 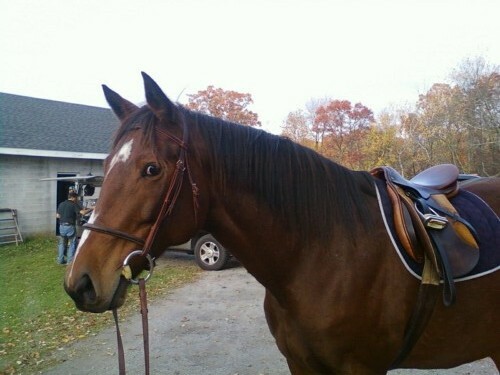 I also think it's obvious that I love this horse. He is just so game for anything, and so steady and willing for a horse this young. Chief will also be featured at Akindale's Family Fun Day on October 17th. You can come and meet him in person and support a fantastic rescue all at the same time! There will also be a signup sheet there for the Chief fan club. Because you might want to get in line....this boy is going to melt some hearts! Thank you for my spiffy new rain sheet! Don't I look dashing? This came in very handy during the gale force wind and monsoon rain these past two days. All the other rain sheets were short on me so my bum always stuck out and got wet and cold...that's not fun. But this new sheet is toasty and waterproof - bum included! I hope you can come to visit me soon and admire my new wardrobe, as I create divots all over the field. I'm really good at that.